Some 90% of farms redistributed to South Africa's black population from white farmers are not productive, the government has said. Land reform minister Gugile Nkwinti warned the land might be repossessed if the farms continued to fail. Almost 60,000 sq km (23,000 sq miles) have been redistributed under policies aimed at benefiting black people who were left impoverished by apartheid. The land was bought from white farmers who sold up voluntarily. The BBC's Pumza Fihlani in Johannesburg says some black farmers are likely to argue that they have been struggling to get the resources and skills to develop their land. And repossessing the land would provide a whole new problem for the government, our correspondent says, as any move to return the land to its former white owners is bound to be controversial. The government had set a target of 2014 to redistribute one-third of white-owned land back to the black majority. But Mr Nkwinti acknowledged that the deadline would not be kept. He said the focus would now shift to helping the black farmers make their land productive. "The farms - which were active accruing revenue for the state - were handed over to people, and more than 90% of those are not functional," he said. "They are not productive, and therefore the state loses the revenue. We cannot afford to go on like that... No country can afford that." At the end of apartheid in 1994 almost 90% of land was owned by the white community, which made up less than 10% of the population. 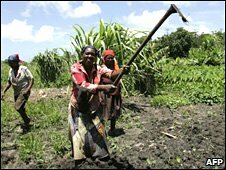 Land reform is a sensitive issue in South Africa and has been brought into sharp focus by the decline of agriculture in neighbouring Zimbabwe, where many white commercial farmers have been violently evicted. Rainbow nation - dream or reality?